The 70th annual Primetime Emmy Awards honored the best in television on Monday night including a few wins for LGBT TV. The biggest night in television kicked off with an opening dance number led by “Saturday Night Live” cast members Kate McKinnon and Kenan Thompson. The bit jokingly celebrated Hollywood finally finding a solution to its diversity problem. McKinnon and Thompson were later joined on stage by other TV stars such as “Unbreakable Kimmy Schmidt” star Tituss Burgess and RuPaul. “Saturday Night Live” continued to represent itself as the show passed on to its hosts Colin Jost and Michael Che. “RuPaul’s Drag Race” made herstory with its win for Outstanding Reality Competition Series rounding out five total wins for the show. RuPaul, Michelle Visage, Ross Matthews and Carson Kressley all were on stage to accept the award. 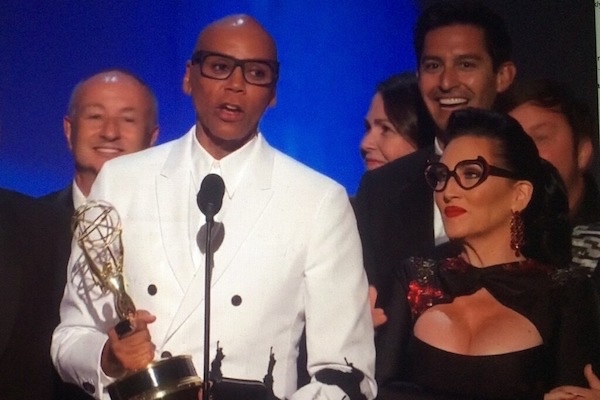 RuPaul also won his third consecutive award for Outstanding Host at the Creative Arts Emmys. “The Assassination of Gianni Versace” also was honored with Ryan Murphy winning Outstanding Directing for a Limited Series, Movie or Dramatic Special and Darren Criss winning Outstanding Lead Actor in a Limited Series or a Movie. The show also won Outstanding Limited Series. Murphy used his speech to spotlight hate crimes against the LGBTQ community. LGBT representation continued throughout the night with lesbian comedian Hannah Gadbys, known for her critically acclaimed Netflix special “Nanette,” who presented Outstanding Directing for a Drama Series. The cast of “Queer Eye” also took the stage to present as well as RuPaul and Leslie Jones, who recently became close after Jones’ “Drag Race” binge. “Game of Thrones” was the big winner of the night taking home nine awards including Outstanding Drama Series. “The Marvelous Mrs. Maisel” followed close behind with eight awards, including Outstanding Comedy Series, and “Saturday Night Live” also won eight awards. Other notable moments of the night were Henry Winkler’s first Emmy win in his decades-long career for Outstanding Supporting Actor in a Comedy Series for “Barry;” an appearance from Betty White and Glenn Weiss who used his win for Outstanding Directing for a Variety Special to propose to his girlfriend on stage.